I love going barefoot, but my feet are old, and plantar fascitis kicks up in my heels after a week or so of padding around the house with no shoes on. I gave up wearing flip-flops 20 years ago, after I finally realized that the twinge in my knee was flip-flop induced. I gave away all my fun shoes and now wear only sensible shoes with orthotics in every single pair. One podiatrist frowned at my insistent wearing of Birkenstocks. A winter visit to the chiropractor yielded her recommendation of Orthaheel shoes. 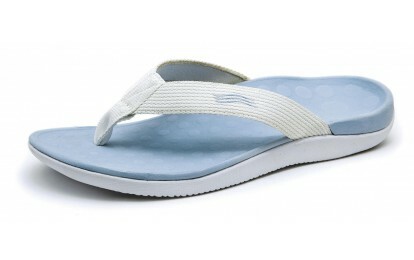 I went to my local shoe store and there on the shelf were flip-flops with a footbed that looks like an orthotic. They were lavender! Of course I bought them for my trip to Southeast Asia. Well, yes, they cost $55. Sigh. The good news is that I walked for 6 weeks in southeast Asia in flip-flops (lavender!) with no twinges or pain. Now I have them with me in the Yucatan. A beach barefoot walk on the beach this morning induced a tiny twinge. Hey! I thought walking barefoot on the sand was good for your feet. On go the foot-saving flip-flops. Worth every penny of that $55. This entry was posted in DHARMA REFLECTIONS and tagged Birkenstocks, chiropractor, Flip-flops, Orthaheel, orthotics, plantar fasciitis, plantar fascitis, sand on March 6, 2013 by cherylwilfong.